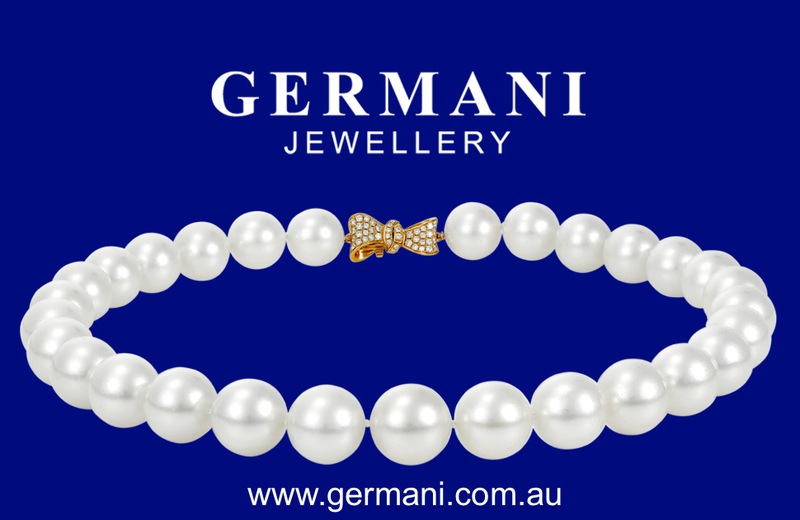 Germani Jewellery has great pleasure in presenting our beautiful selection of Australian South Sea Pearls and we look forward to sharing our knowledge, expertise and passion with you when you view our beautiful pearls. Australian South Sea Pearls are mainly grown on pearl farms north of Broome, off the coast of Western Australia. These pearls are grown/cultured in a very large oyster (that can be up to the size of a dinner plate) called Pinctada Maxima. All oysters are male until they reach maturity at approximately 3 years. They are hermaphroditic, which means that they have reproductive organs normally associated with both male and female they can change from male to female and back again, both male and female oysters are capable of producing the nacre that forms on a bead nucleus implanted in the gonad (reproductive organ) of an oyster along with a small portion of mantle flesh taken from an oyster that is sacrificed specifically for this purpose. When “seeding” an oyster, a bead nucleus (which is of a marine nature – the most successful of which are beads produced from the mussels grown in the Mississippi River in America which is 3,374km long), along with a small piece of mantle flesh. The oyster will accept this more readily and so the process of culturing a pearl begins. It takes 2 – 3 years for the pearl to grow. As the waters off the coast of north Western Australia are warm and rich in plankton the nacre build up on the marine bead whilst growing in the oyster happens more quickly. When the pearl is harvested in the winter months the nacre thickness can be anything from 1.50mm to 4mm thick which is why these pearls have such a wonderful lustre (in gemmological terms this is called, “orient of pearl”). The size of South Sea Pearls grow from 8.00mm to up to 22mm. If the oyster has a yellow lip then it will produce a golden pearl, a white lip will produce a silver/ white pearl and sometimes it will have a pink hue which is optimum. Tahitian pearls, often referred to as “black pearls” are organic gems formed from the black lip oyster (Pinctada Margaritifera). These pearls derive their name from the fact that they are primarily cultivated around the islands of French Polynesia – around Tahiti. Oysters must be 2 years old to be mature enough to begin to produce pearls – inserted with a bead nucleus of marine nature and a piece of mantle tissue from a donor mollusc. The mantle tissue influences the colour of the pearl being produced and provides epithelial cells to ensure that the oyster produces nacre around the nucleus. The cultured Tahitian pearl comes in various shapes and sizes, they range in size from 8 – 18mm. Shapes include drops, baroques, button, circled. Round Tahitians are the most valuable with a “peacock green” hue or overtones. They produce an incredible array of iridescent colours. Tahitian pearls are the only pearls that have a full colour spectrum, this colour range covers the spectrum from light creamy, white and grey to regal greens, iridescent peacock, pistachio, aubergine and deep black – not dyed – all natural colours! The black-lipped oyster has a pigment called melanin – this creates the dark colour in Tahitian pearls. The thinnest nacre allowed by French Polynesian law for export is 0.8mm. Anything under this thickness is pulped by the French Polynesian Government so as to maintain a high standard. Finally, remember that the pearl that speaks to you, is the pearl you should buy. Some pearls talk, some sing and some are the full opera!! Germani Jewellery look forward to sharing our knowledge, expertise and passion with you when you visit one of our three beautiful boutiques.